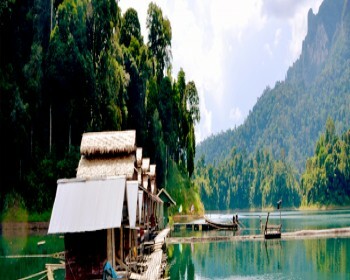 Khao Sok Lake Bamboo Floating Bungalows are the most common on Lake Cheow Lan. If you want an authentic Thai experience, these are the bungalows for you! They are constructed out of traditional bamboo and are basic, yet sufficient. They feature a shared bathroom which is usually less than 100 meters from the raft house. Because these bungalows are made from renewable materials and have land-based bathrooms, they are by far the most eco-friendly accommodations on the lake! 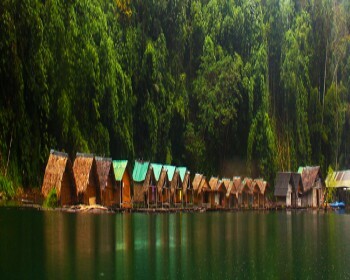 These are the bungalows featured in most of our shared group tours and are the most affordable. These raft houses also tend to be family run, and therefore more likely to have that “small town” hospitality for which rural Thailand is so famous. Nang Prai Raft House is centrally located and boasts a breathtaking panorama view of the central lake and is less than 30 minutes from the Nam Taloo and Diamond caves.